I absolutely love using my slow cooker! With the small people being involved in sports, ballet, and scouts, our afternoons and evenings can get pretty crazy. I still want to feed my family healthy, homemade food, so it makes me happy to find good recipes that utilize my slow cooker. 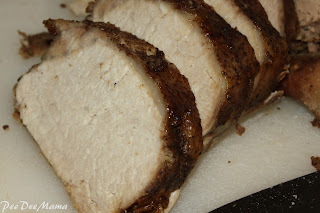 The glaze on this pork roast is AMAZING! The sweetness of the brown sugar combined with the cinnamon was just the combination to entice my small people to eat this. Wash pork roast, trim excess fat, pat dry and rub with garlic. Sprinkle with salt and pepper. Use a fork or skewer to prick the roast all over. In a small bowl, combine 1 C of brown sugar, mustard, and vinegar. Rub all over the roast. Place in slow cooker. Cover and cook on LOW 7 hours. Pour off excess juices. Combine remaining brown sugar with cinnamon. Spread over top of the roast. Cover and continue cooking on LOW for 1 hour. Do you have a recipe to share? Link up below!